The most part of barite deposits in the NW Iran have been epigenetically formed in the form of veins, fracture, and/or open-space fillings. For this reason, structural evaluation is the important factor for investigation of the barite mineralization in the host rocks. Fault and fracture are the predominant structures that can be distinguished in the studied area. Two approaches are proposed for analyzing the structures; the first one is visual investigation. This approach produces a fracture density map and a fracture rose diagram. The second one is used to quantify the fracture distribution by using the fractal dimension. The results indicated that the fracture distribution is not only the controlling factor of the barite mineralization, but also the presence of hydrothermal fluids and the lithology of the host rock that are other important factors in the productivity of the fractures as well. For this reason, despite the high fractal dimension (1.92) in the SE of the studied area, the barite indices have not been introduced up until now, whereas several barite indices in the NW of the study area with low value of fractal dimension (1.62) have been found. Fry analysis data can help us to identify the trend of mineralization in barite deposits. Fry analysis results revealed that E-W trending fractures are the most important structures for barite vein emplacement and subsidiary N-S striking fractures also host for the barite veins, but NE-SW trending fractures are almost barren. In this research, pyrite strain firings were used for temporal evolution of ore deposition. Wrapping of barite around the porphyroblasts reveals that coeval growth of fractures and mineralization with deformation of shear zone and exhumation of host rocks are done by a set of thrust faults in the study area. The authors would like to thank the reviewers of the manuscript for their constructive comments that profoundly improved the primary manuscript. 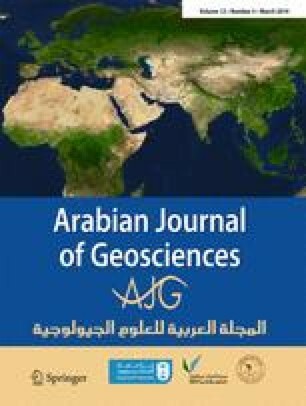 Also, the authors are grateful for the kind editorial work of Prof. Abdullah M. Al-Amri, Editor-in-Chief Arabian Journal of Geosciences. We would like to thank Dr. M. Rezaei-Azizi for review of primary draft. This work was financially supported by the Vice Chancellor for Research of Urmia University (Islamic Republic of Iran).